The Nokia Lumia 925 is the Finnish phone maker’s latest attempt at wooing hapless shoppers over to the Windows Phone 8 platform, and it’s a solid proposition. The real stand-out feature has to be the camera, which is still considered PureView despite being an 8.7MP camera, as opposed to the Lumia 1020 s 41-megapixel shooter. Still, the Carl Zeiss camera is loaded with exclusive Smart Camera software, including a special burst mode that takes ten shots at once. This burst mode lets users do a number of different things, including grabbing the best frame of a shot, composing an action series, or even changing focus after the shot was taken, Lytro-style. It’s pretty much unanimously agreed upon by Natasha, John and I that this is one of the best smartphone camera’s available. But the camera isn’t the only thing that shines: The Lumia 925 has a slight profile with metallic edges and has a solid feel in the hand. John admits that it does soak up prints, however. In terms of specs, a 1.5GHz dual-core Snapdragon chip powers the device, which has 16GB/32GB of onboard memory and 1GB of RAM under the hood. It also sports a 4.5-inch AMOLED display at 1280 x 768. And if that weren’t attractive enough of a deal, you can run in and pick up the Lumia 925 at a T-Mobile for $0 down and 24 payments of $20. In-ear headphones that cancel out almost all of the background noise? Yes, please. The Nokia Essence is the latest stereo Bluetooth to hit the market, and it’s poised to eliminate as much of the world around you as possible – 99.8 percent of it, at least. As many earbuds impel the user to turn up the volume level just to hear more bass, the idea with the Essence is to zap out low-frequency background noises (such as traffic) to provide a deeper bass sound without having to crank up the knob to 11. The Essence is also equipped with NFC for easy tap-to-pair functionality. Scroll down below to see a video showing a guy who’s getting the most out of his new headphones. Shelly made an appearance on Always Mountain Time radio and hit on a wide array of topics in tech: the Connected World, how small businesses have had to change over the years and the different types of media that businesses have to deal with. He also talks about cell phones: why everyone hates the iPhone 5, why you should love the Galaxy S IV, why the Lumia 1020 matters, and why you’d want to buy the BlackBerry Q10. If you’ve ever wanted to take massively-sized photographs without lugging around a DSLR camera, I’ve got a smartphone for you. Last week, Nokia unveiled the Windows 8-powered Lumia 1020, complete with a 41-megapixel PureView camera and Carl Zeiss optics. Yep, you heard me right – 41 megapixels. The massive 41-megapixel images are processed by new Pro Camera and Smart Camera software, which are also hitting other Lumias soon. Since a 41-megapixel image is far too big for a mobile upload, the Lumia 1020 actually saves two versions of each photo you take: the full 41-megapixel image as well as a 5-megapixel version, which is far more conducive to sharing on Facebook. The rest of the Lumia 1020’s specs are good, not great: it features a 4.5-inch AMOLED display, a dual-core processor and 32 gigs of storage. If you’ve absolutely got to own the phone with the best built-in camera on the market, the Nokia Lumia 1020 will hit AT&T store shelves exclusively on July 26 for $299 with a new two-year contract. 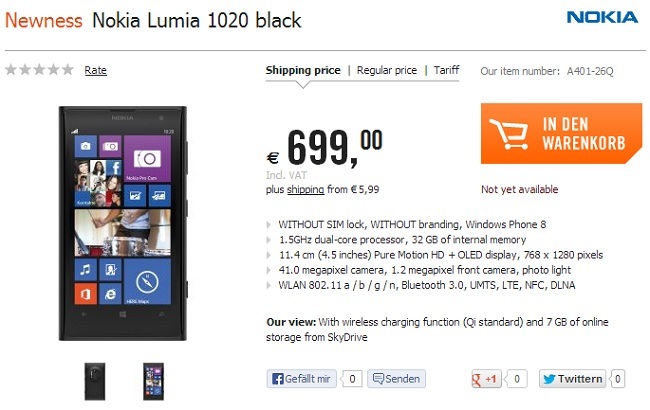 Nokia Lumia 1020 has already been available for pre-order in USA and UK. It was already available for pre-orders in Germany for a hefty price tag of 799 through a few retailers, but now, Cyberport and Handyshop have introduced the device at reasonable price of 699. The device is available on contract as well on Vodafone, O2 and T-Mobile starting from 30. Ever notice how different chargers do not charge consistently or as fast over time? It’s because your current charger loses it’s efficiency after 20-30x of use! EYON’S patented over-current, over-voltage, over-load, and over-temperature protection prevents this! A one of a kind intelligent control prolongs this to 1,000+ charges at 100% efficiency. Eco friendly materials used, energy-saving, certified, digital controlled constant 5V at 1A output. Nokia 6700 Slide Smartphone True Power Car Charger plus USB Cable Kit! Professional 1A circuitry provides constant pure 1A Power consistently, accurately, extends battery life, and never fails! (RETAIL PACKAGING) Features a constant charge true to it’s lifetime that will protect your device while providing accurate charging for life and not fade out like all others, even your original.